Water-technology innovations for emerging challenges. The Advance Programme of LET2019 is already available! The 16th IWA Leading Edge Conference on Water and Wastewater Technologies is designed to be the place where new ideas are introduced and the opportunity is provided to interact with the “best of the best”. This is the global conference where new insights into how pioneering science, technological innovation and leading practices shape the major transformation in water management that is underway. Check the workshops, technical sessions and technical tours options below. Note that both Technical Visits will take place simultaneously on June 14 morning (Friday). In this workshop we will commence with a conceptual and theoretical framework for putting the new biology to work in engineered biological systems in water engineering by Curtis and Sloan. This framework will include what can work and what cannot. Many conceptions of synthetic biology for example are impossible to imply in practice. The details of the framework will then be expanded with a series of presentations that will take the participants on the steps from the genome to individual cells (using genomics and simple metabolic models, from cells to small communities (using individual based models) and from small communities to entire systems (using statistical emulators and computational fluid dynamics). The stumbling blocks will be identified and “work arounds” proposed. Opportunities for hands on work will be provided if time permits. Microplastics – concern of water sector? Microplastics have been increasingly detected in environmental waters. Wastewater and stormwater are considered to be the most significant routes for microplastics to the environment and at the same time, managing of these urban discharges could significantly reduce microplastic emissions. The workshop will cover up-to-date knowledge on microplastics in wastewater, stormwater, and drinking water. We will discuss what information is currently available on these routes. Attention will also be paid to the main knowledge gaps. – What role does the sewage sludge play? – Can wastewater-derived microplastics carry wastewater pathogens and micropollutants to the environment? – Traffic, and especially tire emissions, is considered to be one of the largest sources of microplastics, but where are the tire particles? Let’s discuss these important questions together! The water profession, its people, organisations and institutions are rapidly changing and constantly adapting to new environmental challenges, population growth, ever-expanding technological and skill-sets, as well as the ambition to work towards global cross-sectoral goals such as SDG-6: access to clean water and sanitation for all by 2030. The Digitalisation of Water – i.e. the digitisation of water data/information/protocols/models/forecasts towards a beneficial logical outcome – is an exceptional opportunity to advance the Water Sector, provided that cross-sectorial goals e.g. information-sharing protocols can be established. The emergence of new water technologies is dramatically slow compared to other industries. There are numerous barriers to break through before a technology is adopted and accepted by utilities. On can visualize a pyramid where at the bottom there are numerous ideas, and these most often can develop and studied at the university level. In the middle are the technology companies which must work out the engineering details to make the technology functional and acceptable. Finally, at the top are the adopters which must be convinced of the merits and proven performance of the technology and have a need. The pathway to the top is long and most technologies never make it to adoption. The success rate in the water sector to move to profitably is typically > 12 years. This workshop will involve discussions across the three important sectors; academic, technology providers, and adopters, with the goal of finding ways of bringing valuable technology faster to market. Technical Visits are sold out. If you wish to subscribe to the waiting list, please register here. 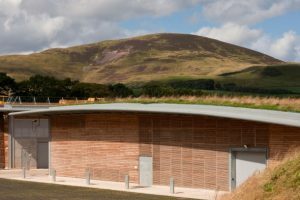 The Glencorse Water Treatment Works nestles in the valley just below the beautiful Pentland Hills Regional Park, to the south of Scotland’s Capital City, Edinburgh. In order to blend into the landscape the structures and buildings are fully or partially buried and covered with grass roofs. The grass roofs are the largest in Scotland and harvest rain water to provide habitats for wildlife, plants and insects. The works is one of Scottish Water’s largest water treatment facilities and provides potable water to around half a million people across the capital city and parts of Midlothian. The plant is designed to provide up to 175 million litres of potable water a day. 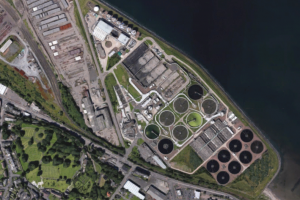 Seafield WWTP is the largest in Scotland and serves nearly 1 million PE, having celebrated its 40th anniversary in 2018. Since 2011 Scottish Water and Veolia have invested £34 million into Seafield, installing new equipment to improve odour as well as a thermal hydrolysis plant which treats and pasteurises the raw sewage, generating biogas energy which provides 85% of Seafield’s electricity. The sewage is then turned into sludge cake and sold to farmers as organic fertiliser. This process makes it one of the greenest waste water treatment plants in the UK. The plant is capable of producing up to 2300 kilowatts of sustainable electricity. In the past 5 years there has been significant increased concern by utilities and the public about micro-contaminants in drinking water. This is part due to improved detection methodologies and increased production of pharmaceuticals and chemicals. This session will focus on the detection and advanced treatment technologies to remove target compounds. There is a need for novel microbial control approaches that enhance water safety and minimize formation of harmful disinfection byproducts and harmful bacteria in drinking water systems. This session focuses on innovative materials and approaches, informed by microbial ecology and techno-economic constraints, for the control of harmful bacteria in drinking water and biofilms. In the past decade there has been much focus on the development of specialized materials for membranes applications for the treatment of drinking water. However, in reality very few of the developments have been applied in working systems. This session will focus on advanced membranes using alternative materials that have been successfully employed in-situ. 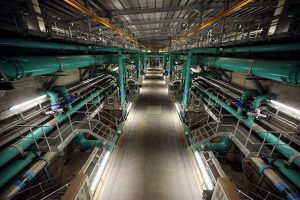 Across the world there has been considerable investment to find alternative approaches to high-energy demanding desalination. This session will focus on creative system solutions and advanced salt separation technologies. The session will focus on novel concepts and processes to improve environmental efficiency of wastewater treatment plants by either optimizing energy efficiency or resource recovery. Papers that discuss technoeconomic life cycle assessment (LCA) or economic aspects are also invited. With the increased public concern related to pollution by emissions of microconstituents of effluents, water utilities have to evaluate the impact of these emissions. This session will address conversions in wwtp’s and efficient technologies for the removal of these compounds. Nutrient removal optimization continues to be an important challenge. This session will discuss the advance in the development of novel technologies such as anammox, granular sludge, membrane aerated biofilms,algae, ion exchange, absorbents etc. Technologies aiming at reaching very low nutrient effluent concentrations are also invited. Waste activated sludge management is one of the main cost factors for wastewater treatment. The session will discuss all aspects of sludge management (including dewatering, digestion, hydrolysis, disintegration,advanced thermal processes etc.) including the handling of sludge liquors and biogas. Showcase your company and solutions in front of over 400 water professionals. The 16th IWA Leading Edge Conference on Water and Wastewater Technologies offers participants new insights into the future of innovation in the water and sanitation sectors taking shape today. It provides an exceptional meeting place to interact with more than 400 renowned leading researchers, technologists and water managers from over 40 countries. For those who are proposing novel ideas and concepts, and those looking for solutions to bring them forward, this is the one conference of the year that should not be missed.